Question #1: Mr. Green says that you are “wrong, wrong, wrong” in identifying this hoya as Hoya padangensis Schltr. I don’t understand his argument but he quotes from what appears to be valid publications. How do you justify clinging to the Hoya padangensis i.d.? ….. Pam Littleton. 1). He says that Hoya uncinata was named in 1853. He is wrong. It was named in 1863. 2). He says that Hoya padangensis was named in 1915. He is wrong. It was named in 1916. Even though he was wrong about those dates, if both are the same species, he is right in saying that the name Hoya uncinata has precedence. BUT, do these two names represent a single species? As described by its authors in original publication. As described and pictured by Schlechter. Leaf size: @ 9 cm. long X @ 3.5 cm. wide. 7 to 10 cm. long X 1.3 to 2 cm. wide. Out of 15 leaves on holotype sheet, only one is as wide as 2 cm. The rest are narrower. Leaf bases: Rounded but sometimes narrow. A bit variable but mostly acute. Leaf apex: Acuminate & acute. Acuminate & very acute. Leaf veins: Almost lacunosa on top; invisible below. Practically invisible top and bottom except when dried. Other leaf trait: Fleshy. White dotted on both surfaces. Very sparsely white dotted, not at all fleshy. Peduncle location: Near apex of branches without leaves. It is in a basal leaf axil on the holotype specimen. C.A. Backer said 1.5. cm. long. 4 to 5 cm. had more than 16 flowers. Pedicels: 3 cm. long, dark purple. About 1.5 cm. long, very pale pink. Corolla colour: Dirty white, inside dark purple spotted. Pale pink and yellow inside, with red dots outside. Outside glabrous. very short papillae. Corolla size: Not noted in publication. C. A. Backer 1.3 cm. in diameter. cited a single lobe at 6 mm. long. Corolla shape: Bases narrow. Margins revolute-folded See Schlechter’s sketches (below). Corona colour: Outer angle white; inner angle rose. Creamy white. Inner angle the same creamy white. Not even a hint of rose at inner angle. Corona shape: Compressed, apexes inflexed-hooked, See Schlechter’s sketches (below). Species sap: Don’t know. The authors never said. Clear. I have been told by degreed taxonomists that if a holotype specimen exists that what is on (or in) it identifies the species, even if, as often happens, the written text says something different. That’s because many of the written descriptions are written by people who do not know the meanings of many of the words they use. For example, Kloppenburg and Wayman almost always describe 3-pli and 5-pli nervation, (with nearly parallel nerves nearly reaching the leaf apex) as pinnate. They are dead in the water wrong. Pinnate nerves arise at the leaf midrib and extent outward towards the side margins, like the divisions of a feather. That is what pinnate means. Ignorance isn’t limited to present day wannabe authorities. There were some dummies in the 17 and 18 hundreds too! I can, with Schlechter’s holotype specimen, prove that I have what Schlechter mounted on that specimen sheet but I do not know what is on the Hoya uncinata holotype specimen. It appears to not exist. If it is still extant, it should be in the Institute for Systematic Botany, Utrecht, Netherlands. 1). J. Donker of the Netherlands collected the plant now in trade as Hoya padangensis. He sent a cutting to me and told me that he believed I had the first one in the US. He thought it was Hoya uncinata, but he wasn’t sure. He hadn’t been able to find a type specimen. He also drew a picture of a leaf with a tip that was turned down like a hook. He said, “The name uncinata was given it due to the “hooked leaf tip.” Of course, it wasn’t named for a hooked looking leaf tip! If a holotype specimen is extant, it should be in the Netherlands (as noted above) but Douglas looked far and wide for it and couldn’t find it. He even had me looking in the 9 herbarium collections I had personally seen. I didn’t find it. Schlechter’s holotype was easily found. I find it interesting that I found Schlechter’s type specimen, or rather it found me. Mr. Green had been telling anyone who’d listen to him that Chris Burton would never be able to prove any of his labeling wrong because, he said, “All the specimens were destroyed in WW-2.” After his claim went around the world for several years, I got a letter from the curator of Botanischer Garten und Botanisches Museum Berlin-Dahlem. He said that the rumor was false and that he thought that I was the one in the best position to let it be known that they had over 70 Schlechter specimens, plus others, some identified and some not. He asked if I were affiliated with a reputable institution that would accept responsibility of the collection as he’d like to send it to me on loan. I sent him the address of Fernbank Science Center and Dr. David Funderburk. The collection was sent with permission for me to keep it for 6 months. I kept it for 3 months. I made life sized pictures of all of them and on those with lots of flowers, took pictures of flower parts. Schlechter had drawn pictures of the flower parts of each of his species and pasted them on the specimen sheets. I think that St. Ted needs to be reminded that he has defended wrong identities of this and of other species that he (off the top of his head) misidentified as Hoya uncinata, just as dogmatically as he is now defending this one. I recall him declaring, in a loud voice and also in his catalogs that the hoya I know as Hoya sp. from Ceram, which Kloppenburg published as Hoya memoria, was Hoya uncinata. He said, “I’d recognize it anywhere.” You’ll find it listed in his 1983, 1984 and 1985 catalogs as sp. Phil. 3. You’ll find it listed in his 1987 catalog as Hoya uncinata with “Phil. 3” in parenthesis. I’m behind in my filing so I couldn’t locate catalogs 1986, 1988, and 1989 catalogs quickly. In the 1990 and 1991 catalog, you’ll find that sp. Phil. 3 is again listed as sp. Phil. 3 and that Mr. Green was claiming that Hoya gracilis is a synonym for it. It isn’t! If the man guesses often enough, maybe he’ll eventually get it right! 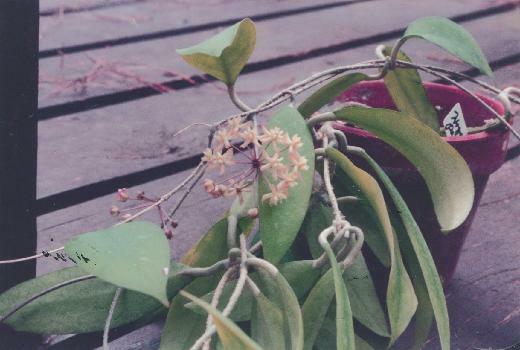 It is possible that the species in my picture is Hoya uncinata but before I will accept that as fact, I want to see a holotype specimen or a good picture of the Hoya uncinata holotype, with flowers present in said picture. I don’t think that will happen because I believe that the holotype specimen is extinct. There are too many hoyas floating about (sans identities) that fit the authors’ written description but which do not resemble the species in question.. Still one more reason for thinking this is not Hoya uncinata: The authors said that Hoya uncinata is an Acanthostemma. This plant is definitely NOT an Acanthostemma. I can only assume that these two men knew what an Acanthostemma is. Schlechter called it a “Eu-Hoya.” That’s a synonym for “Hoya.” All taxonomists of the past, both amateur and professiona,l tossed any hoya that didn’t seem to fit anywhere else into that Section. I have given up on sections. They only add to the confusion. 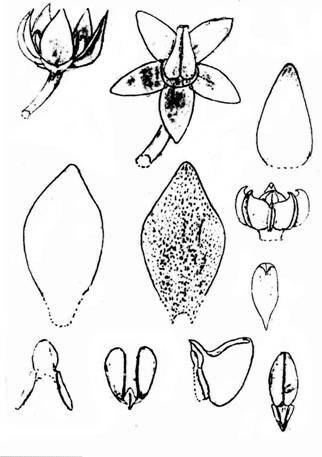 Schlechter’s sketches of the flower parts, which he attached to his holotype specimen of Hoya padangensis, Schlechter #15916. Questions # 2 through too many to count: Rarely does a day pass than I get this question asked. “Why can’t I find anything about Hoya ----- on the Internet? Answer: See my long winded diatribe below. Old time Hoya Society International members may remember me saying that the writing of Hoya names is like the old game of “Gossip” that we used to play, when we were children. You form a circle. The first person whispers a secret into the ear of the next person, who whispers the same secret into the ear of the following person, --- and so on to the last person whispers into the ear of the first person what he or she heard. As you know, what was repeated by the last person was rarely (probably never) what the first person said. I have had several occasions when I was able to trace a single wrong species names through several sources. For example, I once gave a Hoya lacunosa to a hoya correspondent in St. Louis. That person gave a cutting of it to someone downstream in New Orleans labeled Hoya lacinosa. The fellow in New Orleans gave it to someone in south GA labeled Hoya lacinusa. That person passed a cutting on to someone in Florida. That’s when I became aware of it as the Floridian advertised it in the Florida Market Bulletin as Hoya lacinus. I ordered one and wrote to the person who sent it to me and told her what the correct name was and asked her where she got it. Unlike some, I had no trouble getting each of those people to tell me their sources so I was able to trace it back to me. Each person had changed a letter in the name and at the end, it was a different name. Today, (14 March 2011), I found a lot of misspelled names on eBay, along with some outright wrong names, but the misspelled ones bothered me most because I got so many letters asking me why they couldn’t find anything on the Internet about hoyas with those names. Old timers and true hoya authorities aren’t going to be fooled by those spelling mistakes but beginning growers often are. I say that because I remember well my own gullibility when I first started out. It wasn’t until a lady in Texas sold me the same clone of Hoya australis labeled Hoya coronaria, Hoya coriacea, Hoya gigas, Hoya darwinii, Hoya pottsii, Hoya pycnophylla and Hoya samoensis, plus several other names I don’t recall off hand, that I realized I was being taken for what was in my pocketbook. That lady had many articles and lots of pictures in many gardening and horticulture publications. She was considered an “expert” by the uninitiated and a charlatan by the well informed. I believed she was right when others thought her wrong --- until all those pots of Hoya australis subsp. tenuipes started blooming. Even a child could look at them and tell they were all identical. Hoya australis is one of those that often takes several years to initiate first bloom. One can buy a lot of it in the five or six years before the first one blooms, and miss obtaining all of those one thinks one already has because of the labels on the duplicates. One usually has also distributed those duplicates with the wrong labels. I know I did, until I learned better. Once in print, in a magazine, on a sales list or on a plant label, it never goes away. I still encounter plants I know were circulating with those wrong labels in the 1960s and 1970s and they are still circulating with those same wrong labels today. Here are a few wrong names and/or misspelled names I saw on eBay recently. Hoya vetilina.” I suspect but am not 100% sure but I think what she has (or thinks she has) is Hoya vitellina. Hoya fischeria. Without a doubt, what she has is Hoya fischeriana. Hoya dolicosparte. I am quite sure what she thinks she has is a Hoya dolichosparte. Hoya “sp. Gold Star.” What she has is Hoya cv. Gold Star. This is one of Genevieve McDonald’s cultivars. Hoya juanguoina. The correct way to spell that is Hoya juannguoiana. One Hawaiian grower, who has proclaimed time and again that she was out of business, is now advertising on eBay. I only saw three plants there this week and two of them were misspelled. Wannabe advertised a Hoya doliocosparte. Of course, there is no such hoya. What she has is probably Hoya dolichosparte. She also listed a Hoya lacunosa ssp. palidaflora Of course, there is no such hoya. What she may have is Hoya lacunosa var. pallidiflora. I get hate mail, from time to time accusing me of all sorts of crimes because of my picking on people for misspelling hoya names. They say that everyone knows which hoyas they mean, even if the names are misspelled. Even more frequently, I get letters asking me to tell them where to find information about hoyas they have read about on forums or have seen advertised on eBay or in dealer catalogs. These people tell me that they have searched all over the Internet for information about these hoyas and can’t find them. Friends, that is the reason it is important to spell the names correctly. COMPUTERS ARE DUMB! They can’t find anything that is misspelled. Even one missing letter; one extra letter or a pair of transposed letters will confuse the computer. So, learn to spell if you want to find answers on line --- but be warned, not many of the answers you will find on line are the correct answers. If you want to learn about hoyas or any other plant, find yourself a land grant college library, which will have copies of Index Kewensis. Copy all the hoya entrances from all volumes of it and then look up the references cited there. Most will be in Latin so you’ll have to translate. You’ll also find some in German, Italian, Swedish, Chinese and Russian. IPNI is the closest thing to Index Kewensis on line. Consult that and remember what I said above. Spell it right or you’ll not find it there. I started this two months ago. On the 24th of March (on eBay) I found the following misspelled hoya offerings: collistophylla, eliptica, incurvata, vitelena, penchoi, multifora, archboldina, blasharnaeaii, and meridithii. Everyone misspells a word now and then but the number of misspelled hoya names I keep bumping into appears to me to be more than just human error! Nobody. I’m sorry, folks, I wasn’t thinking when I made that offer. I should have known that one would just about have to own that plant to know the answer and that anyone who owned it wouldn’t bother trying to win one by guessing what the unusual trait is that it possesses. The answer is that its sap is bright yellowish-green (or greenish-yellow), not white as the sap of most hoyas and not clear as the sap of Hoya carnosa and its closest kin. There was only one person guessing what that trait was. She tried so hard but without a plant she couldn’t know so I gave the plant to her for trying so hard. Just when I had begun to think the owner of SRQ Nursery was beginning to get it right, I went on eBay today (April 24, 2011) and was horrified by what I saw there. Among about 40 or so Hoya plants being offered, there were (if I counted correctly) 26 hoyas with what I am 100% sure are IML numbers but with the IML suffix removed and the initials SRQ substituted. Some of us recognized these numbers for what they are but turn over in hoya collectors is high, resulting in lots of green as grass newbies looking for hoyas to buy. Newbies aren’t likely to know that the SRQ-1600 or the SRQ-775, etc., advertised on eBay today is the same species I gave them labeled IML-1600 and IML-775 yesterday. I don’t know about the rest of you but I consider changing the suffix on the Liddle accession numbers and claiming them as one’s own accession numbers is highly unethical. There ought to be a law!!!! For you newbies, note that any SRQ number in that list lower than 3000, is an Iris Liddle’s Accession number. SRQ has not, I am 100% sure, collected any of those hoyas. I don’t know whose numbers those in her 3000 series are. If she wants to give her’s numbers, let her start with the first one she got and count from there, SRQ-1, SRQ-2, SRQ-3, SRQ-4, etc. Make a list the way the Liddle’s did and note the source of each and the name and/or number that was on it when obtained, so that when identities are determined, she (and her customers) can look through her list and make corrections. SRQ’s April 24 eBay listing included one labeled “SRQ-0775-Hoya bordenii.” I don’t know for sure what it is but I do know what it isn’t and it isn’t Hoya bordenii. I suspect it may be Hoya benguetensis. 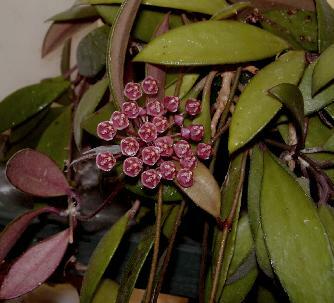 Not one feature of the pictured plant matches Hoya bordenii. SRQ’s listing of “SRQ-1631 as Hoya blashernaezii also appears to me to be phony. My reason for thinking this is that the foliage in the picture shows pinnate nervation and it appears wider in ratio to length than the leaves of Hoya blashernaezii. Hoya blashernaezii’s leaves have 3-5pli nerves. SRQ misspelled Hoya neoebudia as “neo-budica.” There are two things wrong with that. 1). There is no such place as budica. An e was left out. 2). The rule is that one hyphenates a species name when two stand alone words are combined to create the name, as, for example, “purpureo-fusca.” Purpureo is Latin for the word “red-purple.” Fusca literally means brown but traditionally has been used by authors to mean “dark.” Because these two words are stand alone words (one a noun and the other an adjective), the name purpureo-fusca should be hyphenated. In the case of Hoya neoebudica, no hyphen should be used because neo- is a word element, as is “ pseudo-.” The only time you’ll ever see either used without being attached to another word is in a sentence like the one before this. Neo- and pseudo- must have something added to tell us what is new or what is phony. In this case, even the author of the species hyphenated when he shouldn’t have. The name tells us that the plant is native to the New Hebrides, which is now known as Vanuatu. WARNING: if you have 6” white pots with hangers as pictured here, get rid of the hangers pronto. Several years ago I was getting ready to buy a case of 6” hanging baskets from my favorite wholesaler (Park Seed Company, Wholesale Div. in Greenwood, SC). Before I opened the catalog, I got a letter from one of the old MSN-HoyasRUs Forum members, offering me case of 6” hanging baskets at a ridiculously low price. Park’s price was low but this fellow’s was lower. I now know why. I’m sure he got snookered into buying them and wanted to unload them on some gullible soul, like me. I am here to warn you that if you run across hanging baskets with those extremely slender white clip-on hangers, pass them by. You don’t want them. Note the broken clip-on. When the first hanger broke I was trying to move the pot from one line to another and I blamed myself for rough handling. When the second one broke, I again blamed myself but it wasn’t long before I realized that the blame was not mine. The case of pots I bought contained 24 pots. I have only three left with those hangers and I don’t hang them anymore. I gave up on them the morning I went into the greenhouse and found 3 of the pots on the greenhouse floor and the plants that were in them bruised and broken. The same day, another pot fell to the floor as soon as the sprinklers turned on. Still another fell from the weight of a single gecko that skittered across the top of the hanger. 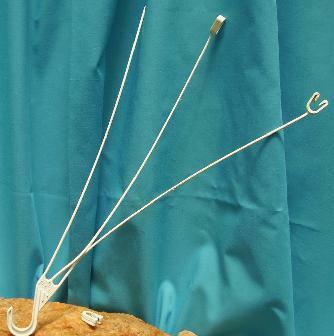 If you have plants in pots with this type of hanger, my advice is, repot immediately in sturdier pots with wire hangers. Here is how he described the leaf characters, “Leaves opposite, widely scattered, thick or leathery, curing grayish to yellowish brown, entire, the edges sometimes pressed with involute margins, narrowly oblong or oblanceolate, velutinous beneath as well as densely or numerously papillose, the upper surface very similar but only slightly,“ etc. I got this from David as IML-1301 and IML-1282. Neither has bloomed for me either but I am 100% sure that neither is Hoya pubifera because both are as glabrous and hair free as a baby’s bottom! I am of the opinion that IF Hoya pubifera is a hoya that the two species that come closest to matching it are DS-70 and sp. from Cebu City. I haven’t seen leaves as large as those on the “authentic specimen” but some come close. Both have those “involute leaf margins.” They are both velutinous beneath as well as numerously papillose, etc. and the leaf shape is as described, just smaller. I’m not saying that one of these is that species but that’s where I’d begin my investigation if a DNA test is ever made on Elmer’s specimen. Speaking of sp. from Cebu City. Mine is blooming on a half dozen peduncles today (12 May 2001). Here is a picture of one of them. The flowers are actually darker than they look in the picture. I tried darkening them but my digital camera isn’t the most expensive model and my picture taking isn’t professional quality either. These flowers are as close to purple as I’ve seen on a hoya. A treasured gift to me from a treasured friend, Michael Miyashira.